Okay, well it’s warm here in southern Florida (what else is new?) and I’ve got summer on the brain – beach trips, warm sun rays, and fruit salad. I love the colors of summer – in the sun everything looks brighter and more saturated. Everything is warm and brought to life with vibrant pinks, yellows and blues. One of the things I love doing when I get this feeling every year, emerging from the dead chill of winter and looking toward the warmth is jazz up my home decor with some new bright things. What better way to embrace this than with a super easy crochet pattern? 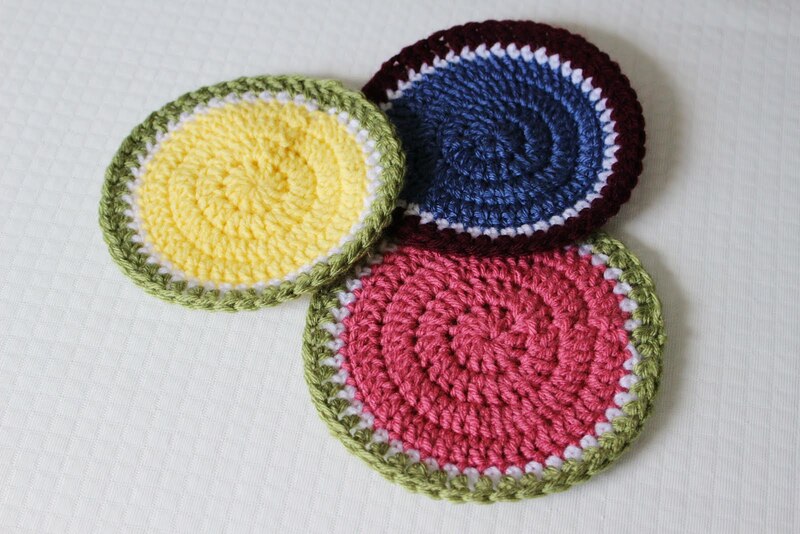 I don’t have many trivets or hot pads in my kitchen collection and wanted something bright and happy for my table – enter the summery hot pads! I took inspiration from watermelon, citrus, and berries for these color schemes but you could follow this pattern with any color combo – it is really so versatile. And did I mention this is probably the easiest pattern I’ve published to date? So straight forward and worked up for me in about 15 minutes. (Pssst – its perfect for beginners too. Here is the handy video tutorial! Make this baby in any colors you like for any season! It’s perfect for those favorite dishes to rest their warm little bottoms on, don’t ya think?